Polar Fridge White CD610, 150Litre, Solid Door, Blown Air, 600x585x855mm. Polar Freezer White CD611, 140Litre, Solid Door, Static, 600x585x855mm. 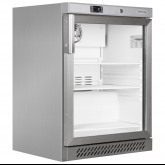 Polar Fridge Stainless CD080, Solid Door, 150Litre, Blown Air, 600x585x855mm. Polar Freezer Stainless CD081, Solid Door, 140Litres, 600x585x855mm. Blizzard Fridge Stainless, Solid Door, UCR140, 3 Shelves, 5cuft, 595x595x820mm. Blizzard Freezer, Stainless, Solid Door, UCF140, 2 shelves, 4.5cuft, 595x595x820mm. Blizzard Fridge, Stainless, Glass Door, UCR140CR, Blown air cooling, 595x595x820mm. Tefcold Fridge White Glass Door BC85, 92Litre, Drinks, Static, 503x560x775mm. 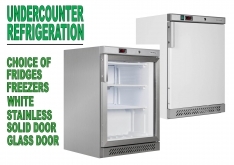 Tefcold Fridge White Glass Door UR200G, 200Litre, Fan Cooled, 600x600x850mm. Tefcold Fridge Stainless Glass Door UR200GS, 200Litre, Fan Cooled, 600x600x850mm.